As you probably realize by now if you’ve read this blog, I’m very partial to American art of all periods. But I particularly favor styles and movements that were not particularly favored by critics in their day (go figure). Yes, I’m not a big fan of academic realism, classical or literary subject matter, or emotion-drenched works of art. While the American Impressionists of the 1880s and 1890s were the first American artists to depart stylistically from academic tradition in painting, the popularly-named Ash Can School was the first radical departure from traditional subject matter. 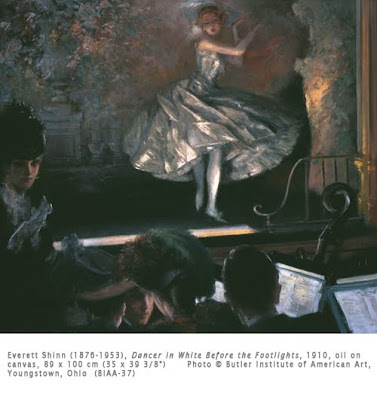 I enjoy the work particularly of Everett Shinn, one of the less well-known artists of the group. Because of his interest in atmospheric interior scenes, his works have an intimacy that some of the other Ash Can artists lack. The Eight Independent Artists (Ash Can School) was a group of eight Philadelphia painters encouraged by their leader Robert Henri (1865-1929) that anything was fair game as subject matter, even gritty street scenes of New York. Born in New Jersey, Shinn, like the other artists of The Eight, began his career as a newspaper and magazine illustrator in Philadelphia. In 1900 he traveled to Paris where it is highly likely that he saw the cabaret scenes of Edgar Degas (1834-1917), the French Impressionist. While working in Philadelphia he met John Sloan, William Glackens, and George Luks. Inspired by Henri, these artists moved to New York and painted various scenes of urban life. This painting shows Shinn’s interest in light and ambience, which he learned in Paris. The palette is different from the Impressionists, but the fluid brush strokes and filmy treatment of light and atmosphere all reveal the influence of Impressionism. The fluidity of Shinn’s brush work may also reflect the influence of Henri’s work, which was grounded in the Dark Impressionism style that ultimately used Baroque painting as an influence. American critics at the time were still not thrilled about Impressionism. They also rejected the Ash Can School artists’ tendency to present asymmetrical, dynamic, open compositions, such as this one, where the focal point is off to one side. Shinn, inspired by Degas, preferred to show vaudeville scenes from the orchestra pit in order to produce interesting lighting effects. Starting in the 1920s, Shinn seems to have lost interest in painting scenes of urban life. Still interested in theater, his output consisted mostly of theatrical backdrops, including ones for the Ziegfield Follies. He also painted many murals, such as a large cycle on the history of New Jersey in the Trenton City Hall council chamber. His later paintings tended to be sketchy, suggestive nudes in interiors and escapist landscapes, but his work never again reflected an interest in realistic scenes of urban life.